The electrical method consist in measuring the electrical resistance of the material and then to note the variation in the electrical resistance. The variation is co-related to the physical defect. A number of electrical methods have been employed in non-destructive inspection and testing of machinery and wide variety of metallic material and parts for dimensional inaccuracies and physical defects. A crack detector operates on the principle that if a crack occurs anywhere within the piece it interfaces with the flow of electric current through the metal, increasing its overall resistance. This holds true regardless of the shape of piece. Operation of the instrument consists of accurately measuring the electrical resistance of some critical machine part between two definitely established contact points, usually chosen at extreme opposite ends and of repeating the measurement at regular intervals. When successive measurements show the increase in resistance at a progressive rate, a fatigue fracture is beginning to propagate and the part should be removed from the surface. Test probe doesn't need to contact the part. Only conductive materials can be inspected. Ferromagnetic materials require special treatment to address magnetic permeability. Depth of penetration is limited. 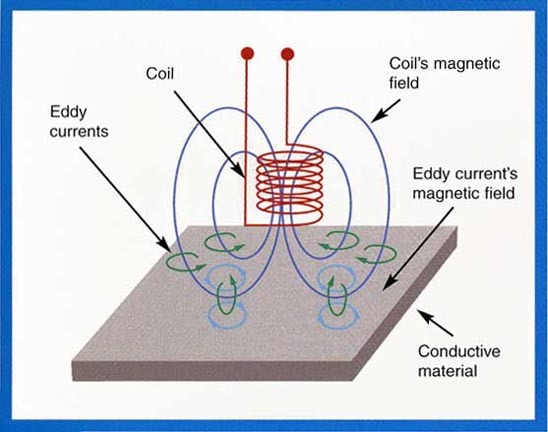 Flaws that lie parallel to the inspection probe coil winding direction can go undetected. Surface finish and roughness may interfere. Reference standards are needed for setup.